Greenland: A Must-visit Place for All the Adventure Seekers! All those who love adventure travel cannot resist the temptation of visiting Greenland. The place is bestowed with the pristine beauty of nature. With the beginning of air service between the United States and Greenland in 2007, number of the visitors have increased tremendously. Not only from the United States, but the people from all across the atlas, visit Greenland every year to see the beauty of wide and expansive landscape. Given here are the reasons to visit Greenland in the forthcoming vacations. Let us have a quick look. In 2004, this site was admitted to the UNESCO World Heritage List. It is a sea mouth of Sermeq Kujalleq (tagged as one of the most active glaciers of the world) and located at the western side of the island. Dramatic changes at this icefjord have attracted the attention of scientists from all across the world. Though the place is spectacular, but it has never been overcrowded. Serene beauty of Icefjord has attracted millions of people world-wide. If you plan to travel to Greenland, make sure that it falls between September and April. This is so because if you visit the place during this time you will get a great opportunity to see Aurora Borealis which are popularly known as Northen Lights. They are there all through the year, but are not visible during winter owing to the light of the Midnight sun. This unusual green occurrence has mystified millions of people visiting to the Greenland. 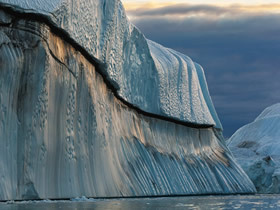 As already mentioned, Greenland is an ideal place for all the adventure seekers. It is a perfect hiking destination. The mesmerizing land is very expansive and the hikes range from just a couple of hours to week long hikes. It is better to seek the help of a local guide who can give you valuable information about the exotic flora and fauna of the place. There is no doubt that the beauty of Greenland is spellbinding but it is a wild country and you need to be prepared with all the requisite equipments. Musk oxens and whales are one of the attractions of this place. All the fauna lovers from far-flung areas visit here to see these animals. A variety of whales like Humpback whales, Mimke Whales and Fin whales are some of the commonest species of whales that are seen in the summer months. Also, musk oxen safaris are available in the Kangerlussaq area of the Greenland. If you plan to travel to Greenland, you should make your trip between September-April so that you can explore more places.